In 2009 I read on Wikipedia that the clothesline is banned in communities across the U.S. My response to reading that was ‘There’s a documentary to be made out of this’. 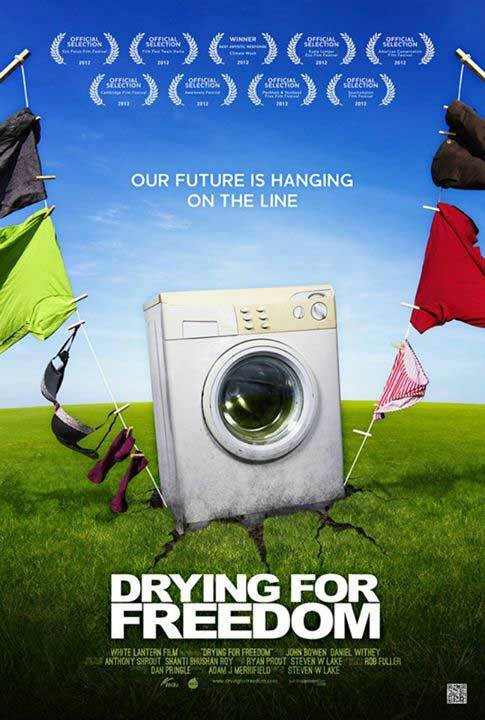 Four years later I had a feature film called, “Drying For Freedom” all about line drying on my hands and I had become an accidental expert on the clothesline. It turns out that homeowners have been fined for hanging out their laundry, that line drying is considered garish, unsightly and supposedly damaging to property values by up to 15% percent. Why? The answers I received making the film were more often than not the same, that clotheslines are ‘ugly’, ‘why not just use a tumble dryer?’ and ‘hanging your clothes outside looks ‘ghetto’. These people did exist but not as many as I had hoped. As an Englishman I had wrongly assumed that people’s default process for drying clothes was on the line. This wasn’t the case. Most people living in communities that banned clotheslines didn’t even realize they were disallowed or that they’d be fined for using one. It just never came up for most people who use a tumble dryer to dry clothes. The Clothesline is the Ultimate Solar Machine. Line drying cuts out the ‘middleman’ and receives its energy directly from the sun. The tumble dryer is the second most energy-hungry appliance in the household (beaten by the fridge/ freezer). It creates 350 pounds of CO2 per household a year (according to carbonfootprint.com). A conservative estimate would place a tumble dryer in 75% of homes within the U.S. (It’s likely to be closer to 91% of homes). Get the boring math out of the way and this adds up to 15 and a half million tons of carbon waste created a year by the tumble dryer in the U.S. In his documentary, Drying for Freedom, Steven Lake travels the world for answers on why anyone would ban the clothesline. The tumble dryer was sold to the U.S. along with a host of other appliances in the late 1950’s as the U.S. became electrified. It started with the television, which, in turn was used to sell other appliances. During this time Ronald Reagan was a representative for General Electric and in a series of infomercials alongside his wife and daughter he would show you the benefits of an all-electric life. The tag line being ‘Live Better Electrically’. The Ethos Behind Advertising Touting the Benefits of Electrical Appliances Stuck. It seems that the idea of having anything less than an all-electric house is not only unthinkable, but any signs that suggest otherwise (such as the clothesline) can send out a bad message about your neighborhood. So now an electric standard has been set. The all-electric lifestyle of homes in the U.S. means that if you are seen to be line drying, it can only mean one thing; that you can’t afford a tumble dryer. It couldn’t possibly be because line drying is better for your clothes, the environment, and your health. Fast forward to present day and we see similar marketing tactics that were used in the U.S. in the 50’s being applied to developing nations. We could look to our friends in the East and implore them to pick a more sustainable mode of development. Sadly it’s not our place to say. The advertising of electrical appliances on developing nations is coming from the countries with the biggest electronic giants. We can fight against all the fracking and oil drilling and gas guzzling cars we want, but progress will be slow and painful in the long run for the fight to save our planet. In order to make a real change, we need to begin to look at ourselves — our definitions of necessity and luxury, and most importantly, we need to look in our own backyards. Posting Guidelines – Stories published on WeHateToWaste.com are intended to stimulate productive conversations about practical solutions for preventing waste. Information provided and opinions expressed are solely those of the contributors and implies no endorsement of the products, services or organizations by WeHateToWaste. Steven Lake’s directorial debut Drying For Freedom had success in the international film festival circuit, and picked up several accolades including the UK’s 2012 Climate Week Award for Best Artistic Response. In early 2013 the documentary went into distribution, securing broadcast deals within the US, Asia and Europe. Steven’s work to date has revolved around the aim of creating lasting social change through documentary; he is a converted environmentalist and advocate for feminism and women’s rights. Great article! I agree that there seems to be a stigma against line drying in today’s society. I think that educating consumers on the ecological impacts of tumble dryers is an important first step in reversing the current trend. I believe that line-drying can also make a comeback once people start to realize that the benefits of line drying outweigh the benefits of tumble-dryers. For example,my grandma used to always say, “no bleach can compare to the bleaching power of sunlight!” Sunlight also more effectively kills bacteria that can linger on clothes, causing odor and health risks. Above all, Line drying can connect us with nature, and make us appreciate sunny days all the more! Growing up, hanging clothes on the line was my favorite chore because it meant that I could go outside and get fresh air! Great points about the benefits of sunlight, Jared! Living in a New York City apartment without a washer/dryer and no Laundromats nearby, I pay a premium to send my laundry out each week. My building is an old walkup with zero cache, yet my landlord contacted me when I set up a clothes line on the fire-escape because it was “unsightly.” I knew that my building’s roof was not finished or intended for leisurely use, which is why it was blocked, but I asked if it was up to code, and it was. The management company had only been using it to store equipment like laters and other tools, but with persistence I got my landlord to agree to allow me and the other residents to hang my clothes line and (grow some plants) during the summer months, saving us all a ton of money! There is so much underutilized roof space in NYC, and in buildings like mine I think that’s easy to change if you just think to ask! Nice work Steven! “In order to make real change, we need to begin to look at ourselves” – couldn’t have put it any better myself. I dry my clothes on the patio furniture, but they always end up wrinkled and a little stiff. Any advice? I love the whole idea of going back to line drying. I do use mine when time allows. If u have a dryer, put the clothes in it for only few minutes after line drying to take that stiffness out. Also using fabric softner in the washer machine will help with taking stiffness out. Make sure u add the fabric softner to the fabric dispenser in the washing machine. Hope this helps. How disappointing to learn that instead of encouraging civil engineers and citizens to work together and try to incorporate space for clotheslines in cities, laws have in fact actively discouraged ditching tumble dryers. Thank you for sharing about yet another interesting topic more people should be made aware of. Living in an apartment building, having access to neither a rooftop nor a terrace, my family and I do try to dry as many clothing articles as we can by windows on drying racks which, though they are admittedly space consuming, do help reduce the amount of cycles we go through and thus energy we consume. But I hope we may start drying all our clothes the “old-fashion way” some day soon. When I was studying abroad in Copenhagen, Denmark, I discovered that tumble dryers are highly uncommon there. My host family did not even own a tumble dryer. They lived in an apartment building with multiple sets of clothes lines outside as well as in the attic. The attic also had drying racks for the building to share. I find it so interesting that the United States is so heavily dependent on tumble dryers, whereas most other countries are not. It is amazing to see the impact of advertising and how dryers were portrayed as ‘necessary’ to have. When tumble dryers were invented, I am sure that many people were excited by the time and effort that they could save, but the impact on the environment was not considered. I do agree with Jared that if more people realized the environmental impact of their tumble dryer, then more may make changes in their methods of drying. After reading this article, I am shocked to learn that you can actually be fined for hanging and line drying your clothes outside! Like Sarah Beth mentioned, I was unaware about the excessive dependence on dryers in the US until I lived with families in Spain for one summer- all of which did not have dryers and instead, line dried their clothing outside their apartment windows. Similar to this is the excessive use of air conditioners in the US. Madrid is in the middle of the desert, reaching daily temperatures over 100 degrees in the summer, and not one apartment I entered had air conditioning. While electricity in Spain is extremely expensive, I feel that many more American households would choose to hang dry their clothes provided they knew how much energy dryers consumed and how much money could be saved by opting out of dryer usage. We live in a fast-paced, on-demand, consumer culture in America which needs to change if we want to see better environmental and health outcomes, however, like you said Steven, this change needs to begin by looking at ourselves, educating ourselves, and changing our ways to be more sustainable. I really enjoyed this post because it suggests something that I think the general public can truly implement. Hang drying clothing is less energy consuming and something younger people may even be more likely to explore, as it’s a way to save money and be more eco-friendly. I had no idea that that law existed in some necks of the (disappearing!) woods, either… so weird. Anyway, for anyone who’s interested in practicing in secret, or who lives in an urban environment with an unaccommodating building setup, you could also always just use a drying rack inside, in case that hadn’t already occurred to you. (Dave, if you try this, you might want to crack a window, if outside weather permits it and/or if you make a regular habit of it; no one likes mold, except mold itself.) Hangers work well, too. Plus, both these options may take you less time than a clothesline, since you wouldn’t have to use clothespins or do any uncomfortable reaching. If you’re still looking for some motivation, you might consider going to your local Laundromat to check out the cost of drying a week’s worth of laundry and then multiply that by 52. Besides, to add to Jared’s grandma’s point about sunlight more effectively killing bacteria, anyone who currently uses a dryer at a local laundromat might take a second to consider (unless you happen to be eating right now or are about to) how many people use those machines every day. I agree that this is a huge way to combat climate change. In order for this to pull off though, Americans will have to get rid of the stigma of convenience and speed in order for the clothesline to catch on again. If Americans went back to the clothesline, it could be a huge reduction in the amount of electricity we use on a daily basis. This article was extremely thought-provoking! I completely agree with “To Make A Change, We Need to Look in Our Own Backyard.” There are a variety of ways one can take to reduce their carbon footprint especially at their homes and I feel not enough people make a personal change to help the environment (although they say they support the environmental issues). Great article! I, too, have been surprised by the stigma associated with clotheslines. Having used a drying rack indoors for many years, it did not occur to me that there would be significant negative responses when I installed my clothesline outside. But then there came the neighbors’ “Not in My Backyard!” comments that seemed to equate laundry with unseemliness and the horror of eyeing someone’s boxer shorts. Somewhere along the way of the modern technological revolution, companies successfully ingrained in us the value of a cleanliness that comes with no visible effort. Such a value could only have been upheld by those economically fortunate enough to be able to buy it. 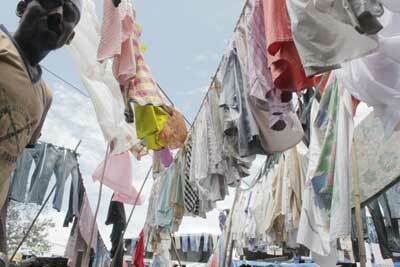 Hence, clotheslines have a class stigma attached to them. We’ll have to turn this idea on its head if we want everyone to embrace clotheslines again. Good news is that many people who can afford dryers are choosing not to use them! My family and I have been hanging our clothes on a clothesline since i could remember. Never thought it was a problem, but it’s interesting that people would be so negative…. about doing laundry? You save so much money from not using a dryer and are helping the environment in the process. What’s the problem? Great article! Growing up in an American suburb with British parents, I ended up as the only kid on the block with a clothesline in the backyard. Initially my family’s underwear hung out on the line for all my friends to see was a reoccurring embarrassment, but I eventually learned to appreciate the economic and environmental benefits of the practice. Now with an indoor line in a cramp apartment of my own, I have no fear of embarrassment from housemates or guests – if anyone makes fun, I just mention all the reasons why this works so much better than a tumbler – and from now on, I’ll point them towards this documentary as well! The idea of looking to ourselves to produce faster change in sustainability is absolutely underrated – while the largest impact will come from a broader change in energy and policy, shifting our habits collectively truly adds up. After briefly living in Ireland, I realized how much line drying is utilized in other nations – and in cold and wet ones, too! This really points to our need to cut out what is unnecessary; unfortunately, many people are not yet motivated to cut out what makes them feel comfortable. The Clothesline is an example of many forgotten methods used in daily living that have been replaced by harmful technology. This documentary is admirable for spreading awareness about how “The Clothesline is the Ultimate Solar Machine” and needs to be used to again. I am always reminded of this whenever I visit my motherland, Morocco. A large majority of Moroccans line dry and no one bats an eye, but this can be attributed to the Moroccan culture of ‘things done by hand are considered better than paying someone (or something) else to do it for you’. Over in the States, one would have many reasons why to line dry instead of tumble dry. Some reasons may be: it’s better for the environment, I live in an apartment and cannot constantly go to the laundromat, a tumble dryer is too expensive, and so on. Point being, the option of line drying instead of tumble drying should always be available. Not only do you people in uncomfortable financial and social situations but you brand mechanical and energy consumptive measures as superior to more environmental friendly practices. I’ll never forget how many looks we got from our neighbors from their balconies when they saw my family and I hand washing, scrubbing, and drying our large floor rugs in the spring time. You would think we were throwing water and suds at them with the way they looked at us.